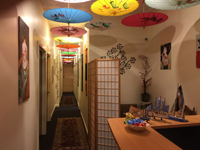 May Linwong and her team have over 20 years experience in the Beauty and Massage Therapy Industry within Asia and Australia. They have been in their air-conditioned premises since early 2005 and have recently added a Far Infrared Sauna (see separate page) to the Spa Room. Their friendly therapists are all fully qualified, experienced, warm and caring. They provide 5 star service and facilities ensuring their premises are ultra clean & hygienic, relaxing and inviting so that your visit is memorable.